It’s going to be a classic 40th birthday party at Pukekohe this weekend and you’re invited. 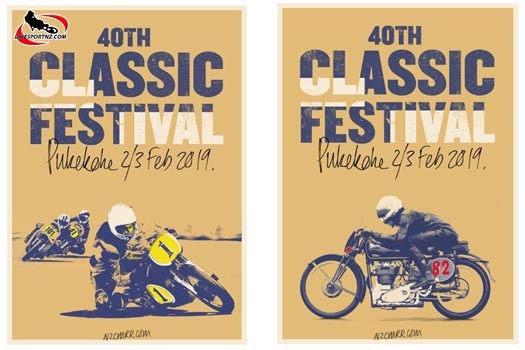 New Zealand’s biggest and most famous classic motorcycle racing festival celebrates its 40th anniversary at Pukekohe on Saturday and Sunday, February 2-3, and it promises to be a birthday party to remember. Originally formed in 1979 for “the preservation and racing of pre-1963 British, European and American motorcycles”, it now includes all pre-1989 racing machines, including Japanese bikes. Over the years the races have attracted World Champions – Geoff Duke, Umberto Masetti, John Surtees, Giacomo Agostini and Kevin Schwantz, all competing on some of the world’s most rare, valuable and famous racing machines. This year, 200 riders and 300 bikes are expected from New Zealand and around the world and the organisers, the New Zealand Classic Motor Cycle Racing Register, will be asking all riders and supporters who have raced at the festival over the last 40 years to help the society create an historic poster and film celebrating 40 years of Classic Racing at Pukekohe by sharing their memories, photos and film.